Are you planning to sell your blog? If yes, you've landed at the right place to learn about correctly assessing a blog's price. Remember, there is no standard or documented way to calculate a blog's value. All we do is using the prevalent method often recommended by experts for the same. And, that's what we're going to learn today. Needless to say, all this blog's value assessment exercise is aimed towards professional or niche blogs. The methodology discussed below is easy-to-follow without any ambiguity. Make sure to grab all the essential statistics associated with your blog to get the most correct estimate of its value. And once you get the value, be flexible with the price tag while negotiating a deal with the buyer. I've used this blog value calculation method for two of my clients and they were able to sell theirs with a very little deviation from the calculated price. So, let's get started and learn to calculate a blog's value in a few simple steps. Feel free to tweak and improve the assessment methods discussed below. A blog's valuation metrics include its niche too. In simple words, your blog's niche can increase or decrease the overall calculated value—by miles. This is independent of your blog's traffic, revenue, or reach. Let's try to understand it with an example. If you're running a blog (with decent traffic) about insurance or finance sector, you're bound to get the price several times higher than the price for a blog about meta-blogging with equivalent traffic. One of the reasons could be extremely high cost-per-click rates for contextual ads for both the finance and insurance sectors. In simple words, the profit margin is several times higher compared to several other niches. A blog's niche directly affects the valuation that eventually increases or decreases the base price—substantially. Meatier the niche, higher is the base price! In fact, there's a sharp division within a broader niche that can be branched out into various sub-niches. If you creating a blog solely for the purpose of selling it at a later stage at a higher price, do extensive research about the popularity and profit potential of a niche. This simple exercise can land you a much lucrative deal at a later stage. Whatever final price you'll quote during the deal, every potential buyer will try to deduct the running and maintenance costs from the gross amount. This does make sense as the money spent on the maintenance of a blog is simply an expenditure amount and has nothing to do with the actual revenue generated after deducting the expenses. A potential buyer may ask for the following details while the valuation is in progress. Hosting fee - Although a typical shared hosting plan ranges from anywhere from $5 to $10, it can be much more depending on the traffic and load your blog experiences at the peak time of the week. For example, if the buyer finds your blog chokes in peak hours and needs a VPS plan to function properly, maintenance costs can inflate significantly. Annual fee of premium tools and software - If your blog is using premium version of products like plugins, themes, analytics software, email marketing service, and social media marketing service, the overall maintenance cost shoots up further and the buyer will take account of all these expenditures too. Payments to writing staff (if any) - Once a blog starts giving handsome returns, bloggers often hire staff to generate premium content on a regular basis. If contract-based writers are working for your blog, that also comes under the radar of the potential buyer. Hiding all these details from the buyer can result in a canceled deal at a later stage. Always make a correct and detailed list of the expenditure to give a clear picture to the potential buyer. Remember, this list should not be given in the preliminary rounds of the negotiation. If you do it, you'll be putting the cap on the deal even before it is matured. Nobody likes to hear about expenditures rather than profits while purchasing a digital asset. Traffic has its own value, but the brand and social reach can outweigh it easily. For a large number of niches, brand value and the scale of social connections earned through the blog are good enough to generate a huge business. If your brand is well recognized among the community and you have an active and effective social media presence, the quoted price can easily go up. People relate it with accounts having a massive following on popular social media platforms. Well, the number of followers has nothing to do with your ability to generate business through these platforms. What matters is, how actively you're engaged with your connections and do they listen to you? If people recognize your brand on social media and you're getting leads from these platforms on a consistent basis, your blog's price shoots up—exponentially. Once the deal is finalized, a blogger has to hand over all the active social media channels to the buyer. These accounts are huge assets for a blogger and one should nurture them with all care as they greatly contribute to elevating the value of the blog. As I mentioned before that there is no standard way to calculate a blog's value. We'll combine some of the common as well as unique techniques to understand how the entire valuation process works. You can definitely make the necessary changes in this procedure to get a near to accurate price for your blog. Step #1: Start with a good old method for calculating the base price. The most common practice to come up with a reasonable price for a blog is to multiply the monthly revenue with multiples of 12. For example, if you're earning $500 per month from your blog, you can multiply it with 12, 24, 36 or 48. Why these 4 different multiples? The more profitable is the blog, the more is the price. For a relatively new blog, a buyer may pay up to 12 months of blog's monthly revenue. For highly popular blogs, this may even go up to 48 months of monthly revenue. Here I must tell you that this method has several flaws though it's used widely for calculating a blog's price. One of the major flaws in such a scenario is the incorrect calculation of monthly revenue. Let's try to understand it with a simple example. A blog giving $100 per month of earnings to the owner may give 5 times the revenue when it is sold to the new owner. This can happen due to several reasons. The most common reason is failing to monetize the blog to its full potential. Another common reason is the poor design of the blog that drives away leads and prospects. There are several other variable factors that may further increase or decrease the base price. We'll look into each of these factors one by one to see how it affects the same. Step #2: Evaluate and add social media & brand value. Bloggers holding a strong presence on Twitter, Facebook, and Google+ can afford to add more cushion to the base price. Although there's no hard and fast rule for the same, it can be done in several ways. First, you must present concrete data about your social reach including examples of leads generated through the same. Once the data is verified and evaluated by the potential buyer, you can safely add reasonable value to the base price. A typical example can be fixing a value for an active and genuine follower and multiplying it with the total number of followers. For example, let's say we set $0.01 value of a genuine follower. If all the combined followers across all the social media platforms are 75,000, the final value comes out to be $750. Remember, you're not selling your followers but simply adding the value of your strong social presence to the final price. Step #3: Evaluate high conversion traffic channels. Unless you're looking to monetize blogs through CPC contextual ads, high traffic doesn't necessarily signify good returns. The quality of traffic coming to your blog decides how much more cushion can be added to the base price. Even with low traffic, a blogger can earn huge amount of money provided the inbound traffic is qualified and is looking for the services and products already being sold on your blog. A potential blog buyer always asked for web analytics data (for up to 6 months) to evaluate the kind of traffic and the conversion rates. If you're able to show him a perpetual source of high converting traffic, you can certainly ask for a higher price. This demands proper tracking of all the conversion funnels through your web analytics software. Once the buyer is assured of quality traffic on your site, numbers don't matter. Step #4: Analyze citation index and evaluate the credibility. If authority sites are quoting and citing your content on a regular basis, you can further elevate the price of your blog. These references are not only vital for SEO but also acts as a seal of credibility. If you can highlight this data to the potential buyer showcasing leading blogs linking to your content, you can again add some cushion to the base price. Remember, these references should link deep to your internal pages. A blog's citation index is one of the important metrics to quantify its value. The healthier is the citation index filled with links from authority sites, the more liberty the owner has to increase the base price. You can easily mine this data through Google Search Console. Fortunately, it has a handy export option that can be used to quickly analyze and prepare a report for the potential buyer. Step #5: Balance the gross amount by deducting a percentage of expenses. Not all the expenses for running your blog should be included while balancing the final blog price. For example, expenditure on a typical hosting plan is quite obvious and every potential buyer is well aware of that expense. It makes no sense to consider it for your deduction list. However, recurring yearly expenditure of vital premium tools and services must be mentioned in a separate list and you must show it to the potential buyer before the deal is finalized. It may lower the final price a bit, but it will help you close the deal by giving the right information about the maintenance cost of your blog. This step is only applicable if the running costs are significantly high and the blogger is using several premium services for critical operations. In fact, if the buyer has no plans to continue the use of a specific premium product, there's no need to consider including it in the expenditure list. This was my general outline of calculating a blog's worth. 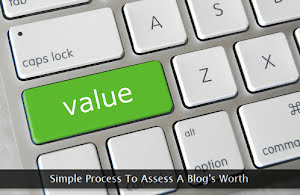 If you have some more useful methods to assess the value of a blog, do share your experience with us. In case, you're planning to sell your blog but are struggling to calculate the right price, you can contact me to valuate it for you.